INCLUDES A BRAND-NEW AFTERWORD READ BY HILLARY RODHAM CLINTON! The blame is on everyone else but herself for losing and not connecting with the major of Americans. Shortest Book I Ever Read! 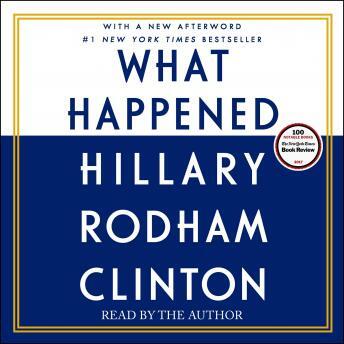 This Amazing Book Not Only Asks The Question "What Happened? ", Bit It Gives Answer To That Question... Right On The Front Cover... I Didn't Even Have To Open The Book! I wish I could give this book a ZERO star! What Happened? **Spoiler Alert*** Donald J. Trump happened! Enjoy! I have read other books by Hillary., but I got so much out of this one on a personal level. I believe everyone should read this book. Her insights are timeless and so well articulated. She gave words to things I’ve encountered my entire life. Wether you love her or hate her you can not deny her truth. It’s important not in understanding her but the world in which a woman attempts to lead and use her voice. We all need to do better. Thank you Hillary for your brutal honesty. Book starts out a little sappy at first, but the last half is excellent. She’s a class act and it’s only by a fluke that she’s not president. Republican or Democrat this is aExcellent tell—all book! As a Hillary Clinton supporter, I viewed this book as very cathartic. While it scratched the surface of emotions that were so intense following the weeks after her losing the election, it also inspired and made me fall in love with her all over again. The audio version made me feel as though we were talking over a cup of coffee at the kitchen table. This is one of those books however that I sort of wish I had as a hard cover book, so I could read and re-read what was being said to help me absorb the message better. I will most assuredly be listening to it again. I highly recommended the book. I am inspired by this book and can't wait to get more involved with community activities. Hilary Clinton would have been the best president and the best thing that ever happened to America. Great book. Well written and Well read by Hillary!